Visual Development: Is a way to explore and figure out the look and style of your final film before beginning the animation process. 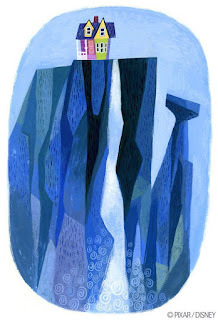 Visual Development isn't just the background images, but the characters, the props, ways of moving a character or object, the environment and the world that the story takes place in. Here are a few early VisDev designs for Disney Pixar's "UP". 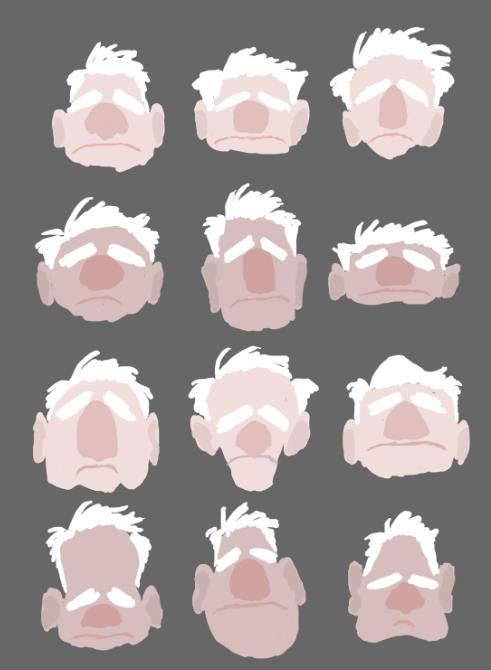 Here are a bunch of simple head designs of an old man... An idea of the House in a different location by Lou Romano. 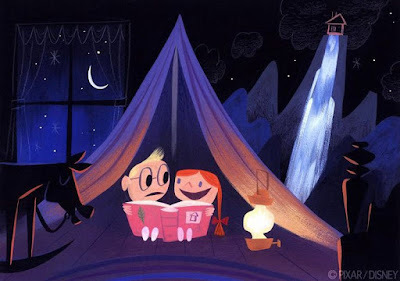 Another Lou Romano design, Its night and the two characters are talking about what is shown on the right of the image. 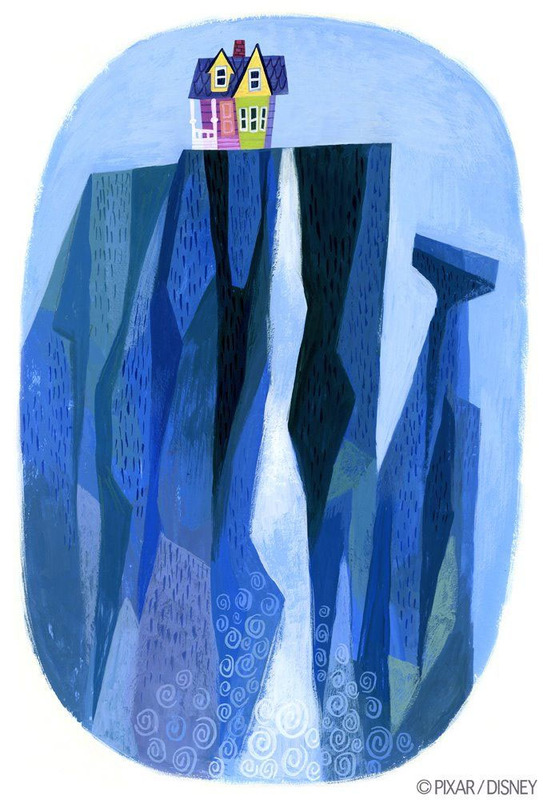 Your eyes start in the middle, drift to the left to see the horse and night sky in the window and then over to see the house on the mountain with a waterfall. 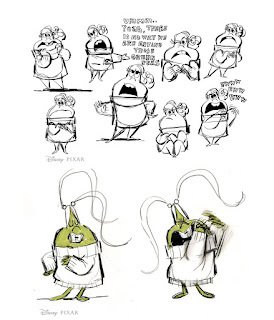 What starts off as simple concepts and drawings, eventually becomes more visually defined. 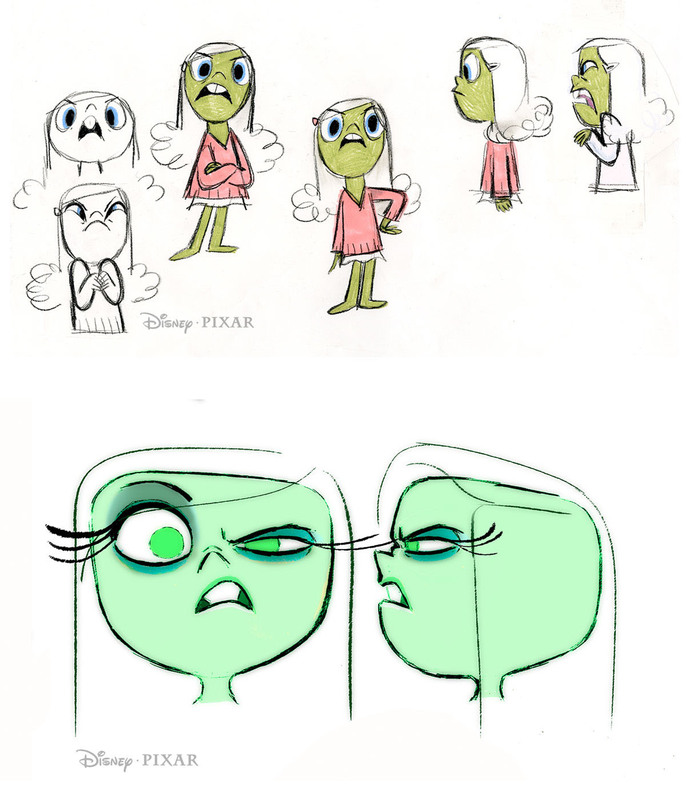 As the storyboard is locked and the Animatic is being assembled, Visual Development begins about the same time the storyboard is being created and Character Designs are coming together. 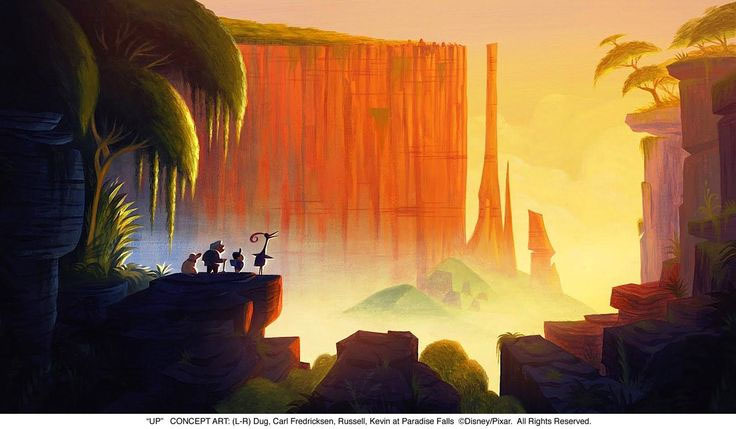 Visual Development keeps on going through the rough animation process to figure out how the rough props or environments will look. 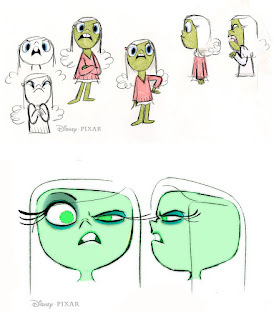 The Director is the one who is approving what the visual look will finally be. 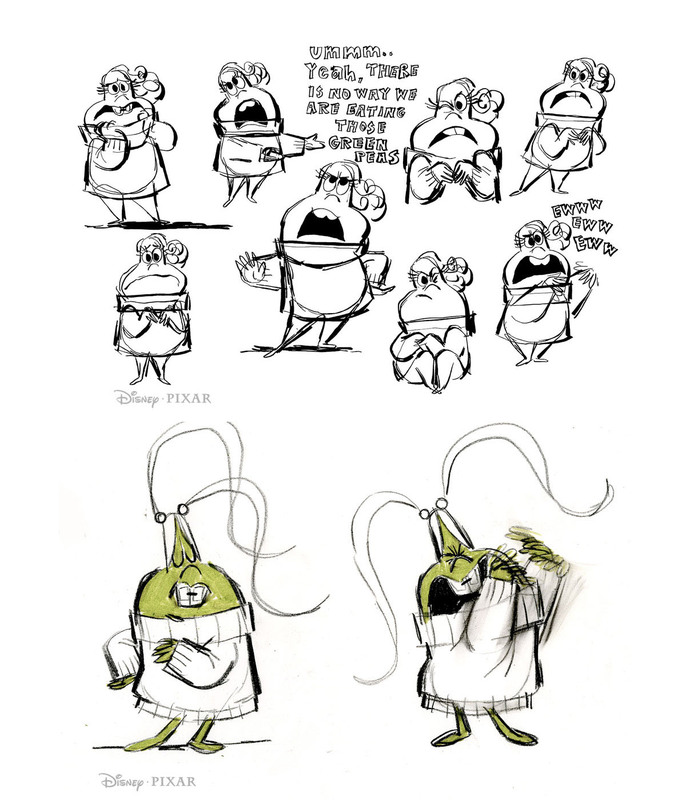 Your visual development must be explored to make it as interesting to look at as possible and which fits the story in general. 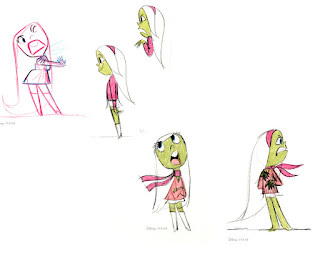 Here are character designs from "Inside Out" by Chris Sasaki. 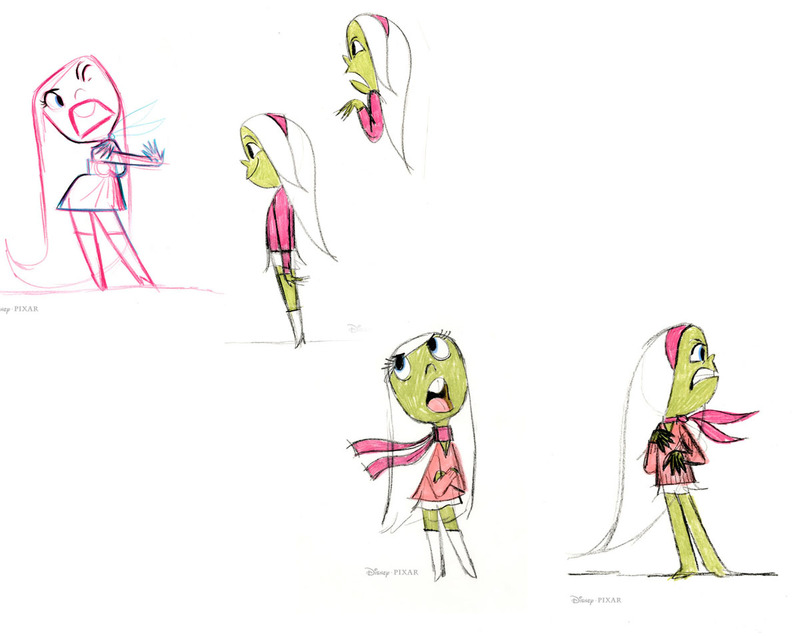 See how the character designs for Disgust evolves into her final look. 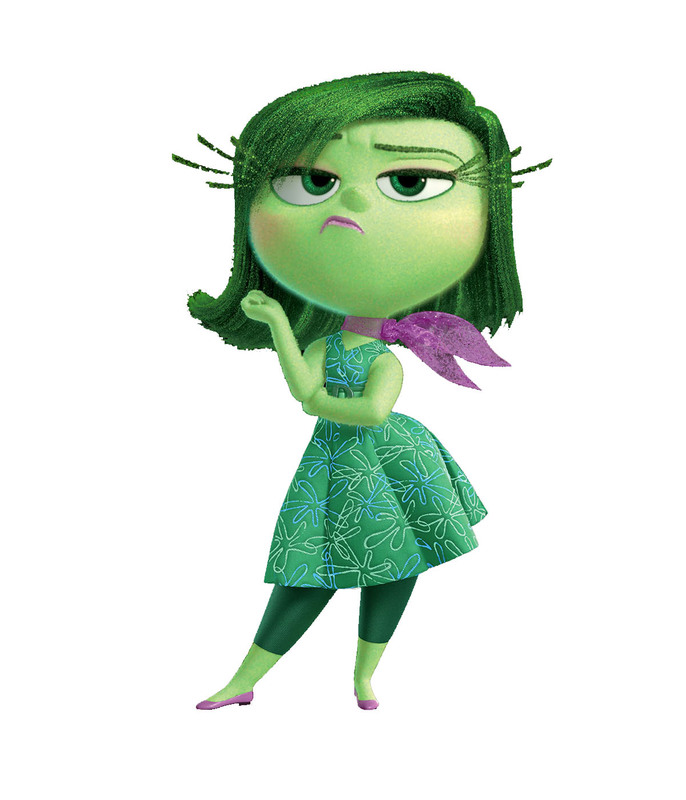 After all the revisions, redesigning and tweaking, we finally get to our final design! Did you know Animateducated is about to hit 25,000 views? We need to do something big for this occasion, don't you think? Let us know your ideas! Visit our Youtube Channel Watchcat Films and click to become a subscriber to see future episodes and show your support! Did you know that by clicking on the ads, Google will give us money that we can donate to a local animal shelter. Everytime you visit this blog, click away on the ads to show your support and help us help some animals in need! This week, we got 4 clicks which yielded .39 cents which is the most clicks we have had in a while. Right now, were only at $26 bucks and Google won't write us a check until they get $100 or more in clicks. So click the ads whenever you visit this blog! Thank You!